In Spain, various plans to develop the use of ICT have been implemented in order to facilitate procedures related to public services, to promote economic transparency and to improve the effectiveness and efficiency of public administration. Nonetheless, some recent studies have shown that the development and implementation of e-government in Spanish municipalities has taken place very irregularly. Research has provided an external view of the implementation of these initiatives, but to date little is known about the opinions of the people directly involved in their introduction and development. 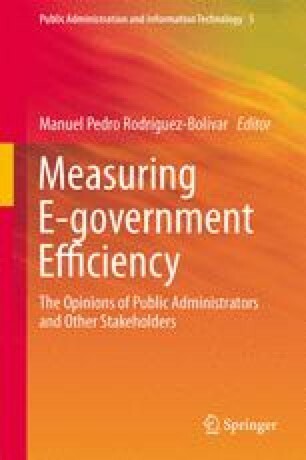 This chapter examines public managers’ perceptions of e-government efficiency, determined by means of a survey in this respect addressed to public managers in municipal governments in Andalusia. The results inform us of the perceptions of municipal IT managers in this area of Spain and show how the heterogeneity of their views is accounted for by socio-demographic variables and by political factors. This research was carried out with financial support from the Regional Government of Andalusia (Spain), the Department of Innovation, Science and Enterprise (Research Projects P10-SEJ-06628 and P11-SEJ-7700) and the Spanish National R&D Plan through research project ECO2010-20522 (ECON-FEDER) (Ministry of Science and Innovation).